Ah, Venice, Venezia: gondola rides, romantic restaurants: Would anyone in their right mind take young kids along? No; but Venice is so magnificent. Here's some advice based on a trip with three young children aged eight, six, and three. With youngsters along, Venice is probably best treated as a side trip of three or four days, maybe on a cheap flight from London, or by train from Rome. Prime the children with a great CD for kids: Vivaldi's Ring of Mystery a musical story set in Venice. Remember that Venice has no taxis—no cars at all. So either travels light or check your extra luggage at the train station. And make sure your luggage rolls on wheels; give the kids their own small suitcases to pull. In Venice, you'll get around on foot, or by some form of boat: from the expensive gondolas to the small ferries (vaporetti) that constantly chug up and down the main canals. Three-day passes for the vaporetti are a good deal; check for discounts for small children and for students. A word about strollers: in Venice, you are constantly walking up and down the steps of small bridges across the canals. A 3-year-old can probably get out of his stroller and walk over these bridges; if your child can't, consider using a backpack. If you do take a stroller, make sure it's ultra-light. Piazza San Marco is the heart of Venice: a huge heart beating with thousands of pigeon's wings. Lately, Venice officialdom has frowned upon the pigeons and is reducing their numbers. But on a recent visit, pigeons were still there and little kids were still wildly excited; small orchestras play at outdoor cafes; parents thrill to the architectural marvels—great fun! The interior of St. Mark's Basilica is so awesome, parents should take turns going in without small kids. Go on Ice-Cream Walks: Walking in Venice is a joy; the trick is to keep those tired little legs trudging onward. The tactic: lure the youngsters on with ice cream treats. Luckily, gelaterias are everywhere, and the ice cream is fabulous if you get "Artigianale" style. Ride a Water-Bus: The younger set can enjoy the boat ride while the parents ogle the palazzos on the Grand Canal: You can catch a vaporetto at many stops, and they run constantly. You can also take a boat trip to the Lido, Venice's beach, or to the island of Murano, famous for glass-blowing. Go to the Peggy Guggenheim Museum: Heiress Peggy Guggenheim loved Venice, and now her home is a wonderful museum that suits kids well. 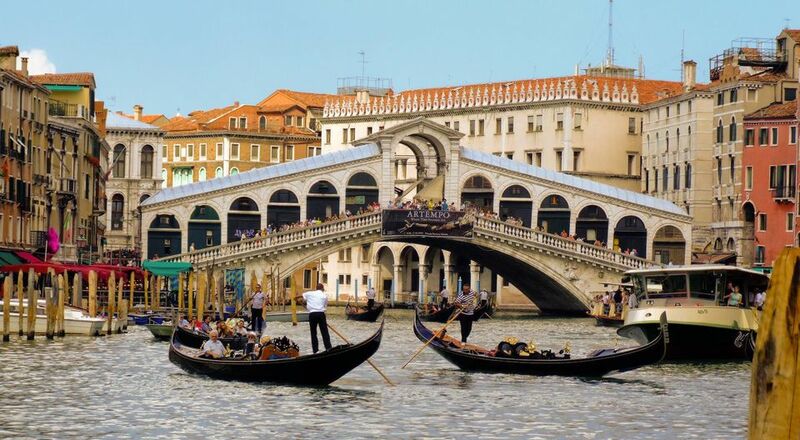 Head to the Academia Bridge, a 20-minute walk from San Marco Square, or take a ferry boat. Follow the signs to a fabulous collection of surrealist modern art—perhaps the most interesting sort of art for young minds, with fantastical creatures and landscapes and animals flying through the sky. Outside is a lovely sculpture garden, where kids can run around. There's also a large patio right on the Grand Canal. What Will They Eat and Drink? How kid-pleasing can you get, with ice cream and pizza on display everywhere you turn? If you're lucky, your offspring will use the washrooms at the charming "trattoria"s where you buy lunch. Most children, however, only need a washroom 10 minutes after one is available. In such cases, you may notice certain posted signs directing you to a public "WC." You may need to pay to use them. It's sometimes hard to have little kids' hands tugging on you when you want to bask in beauty and art. But Venice is worth almost any price. Meanwhile, you're introducing your children to a true cultural icon: Venice will always be especially theirs.